A concrete truck tipped over in the construction zone at the Penticton Regional Hospital on Thursday. It’s not everyday you see a concrete truck flipped over on its side. That’s exactly the view staff and patients at Penticton Regional Hospital were treated to Thursday morning, looking out hospital windows where the new patient care tower is under construction. 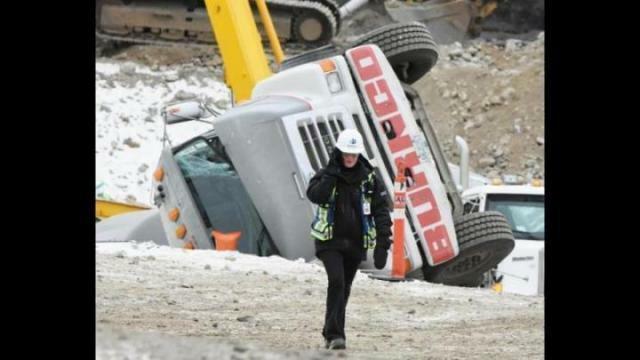 The circumstances leading up to the truck tipping over are still being investigated, but no one was hurt in the incident, which happened as the truck was backing down a slope to pour concrete at the lowest level of the new construction. “Everyone was fortunately safe,” said Dustin Luchka, spokesperson for EllisDon Construction. He also noted that there was no lost time due to the accident and crews were able to work around it. “They actually finished up the exact pour they were doing,” said Luchka. As of Thursday afternoon, the concrete truck remained on its side, and Luchka was unsure what it might take to get the vehicle back on its wheels. “From what I gathered the drum itself was full. I have to assume machinery is going to be involved. That’s got to be a heavy guy, that’s for sure,” he said. EllisDon will be conducting their own investigation, along with WorksafeBC. “WorksafeBC will do theirs, but we do ours as well. Safety is of the outmost importance. These are dangerous jobs,” said Luchka.